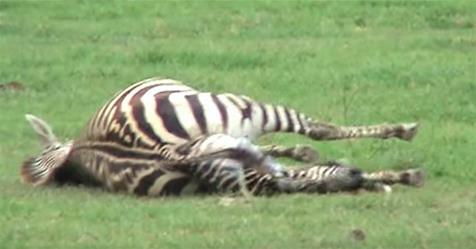 Home › videos › Mother Zebra Suddenly Collapses, But Keep Your Eye On What's Happening Under Her Tail. WOW! Mother Zebra Suddenly Collapses, But Keep Your Eye On What's Happening Under Her Tail. WOW! Being able to have a child is a beautiful gift. Sometimes, that gift can be a long and grueling process, but nonetheless, the end result is always a beautiful newborn baby. Although watching the birth of an animal can sometimes seem a bit gruesome, it’s also a complete miracle to watch a new life come into existence. In this fascinating clip, viewers get to see this mother zebra giving birth to a baby foal in the Ngorongoro Crater in Tanzania. Not only is this foal adorable, but he’s also pretty well-developed and weighs close to 70 lbs. I was surprised to see the newborn baby already up and learning to walk by the end of the clip, but supposedly, that’s completely normal for a young zebra. Sometime after 15 minutes have passed since its birth, the foal is already able to stand up on his own and attempt walking. Within the hour, the foal is walking and able to join the rest of the heard by his mother’s side. Due to how vulnerable foals can be to predators, it’s a necessity for them to learn how to walk and run immediately. Running plays a crucial part in both a young and mature zebra’s survival. I was so mind-blown by this zebra’s birth that I couldn’t take my eyes off this beautiful newborn baby. The way his mom licked him and stood directly beside him was absolutely precious to watch.